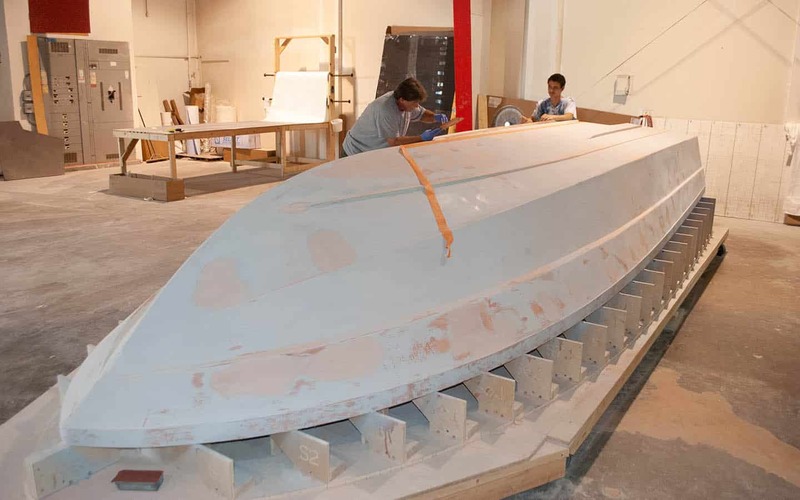 Piranha Boatworks strives to provide each owner with their very own custom made skiff. We use only the highest quality materials and the latest building techniques. Each boat is hand-laminated to exacting tolerances. Cure times, ambient temperatures, and attention to detail all go into the process of manufacturing your Piranha boat. First, we have a discussion with you in order to build you a skiff that meets your individual needs. 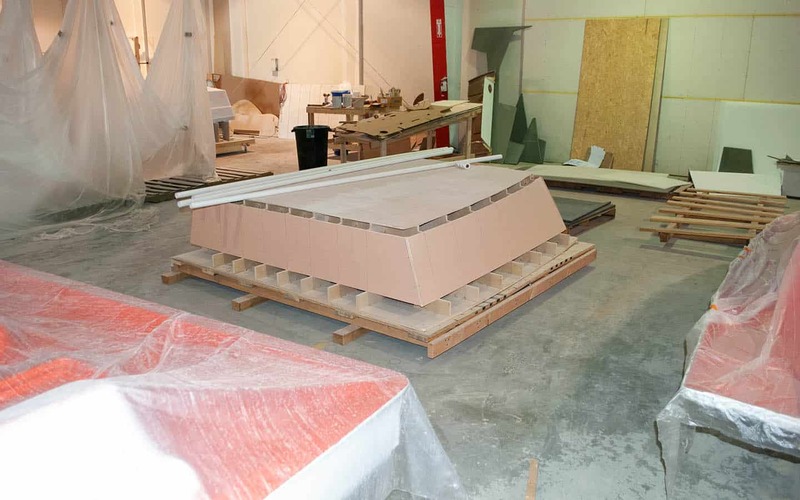 How the boat will be used is critical to the build process. Your input will dictate the storage layout of the boat, including live and release well requirements. We help you customize your trolling motors, insulated coolers, rod holders, and poling platforms to give you the perfect vessel. Once these decisions are made, the building process begins. The molds are waxed and polished with release agents to ensure proper separation. Next, your chosen gel coat color is applied to the mold. The approximate gel coat thickness of 22 millimeters is then allowed to cure before the next layer of fiberglass mat and high quality spec low-profile polyester resin is applied. This process continues with several layers of biaxial woven fiberglass. The fiberglass mat is applied and cured with the resin. The lamination schedule is followed in great detail with consideration given to ambient temperature, humidity, and manufacturer-dictated cure times. 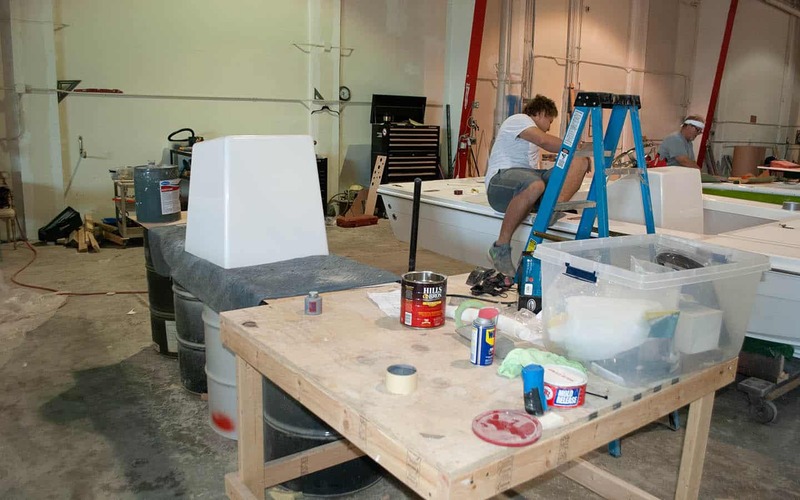 This process is followed for each cap, liner, console, and hatch that is needed for your boat. Once all of the components are completed and cured, the assembly begins. The first step is to tack in the stringer system for added support and strength. The stringer system is attached to the hull while it is still in the mold. This controls any unnecessary flexing of the hull while the stringer support is adhered to the structure. Then the electrical, plumbing, and power systems are placed into the various components. All of the stainless steel and aluminum hardware pieces are attached to the hull, hatches, consoles, and deck. Once all the pieces are in place they are sandwiched together and chemically bonded to one another to create one solid piece. Piranha’s quality system ensures that your boat meets or exceeds all standards of quality and durability. We inspect our skiffs after each critical juncture in the creation process. Our build process is designed, monitored, and constantly upgraded to guarantee that the boat you purchase from Piranha meets your high standards and ours. *Base Hull pricing does not include gauges. Gauges are included in motor packages only. *All prices are subject to change. Copyright © 2019 Piranha Boatworks, LLC. All rights reserved.